DU 7 College Honours 4th year Routine 2019. 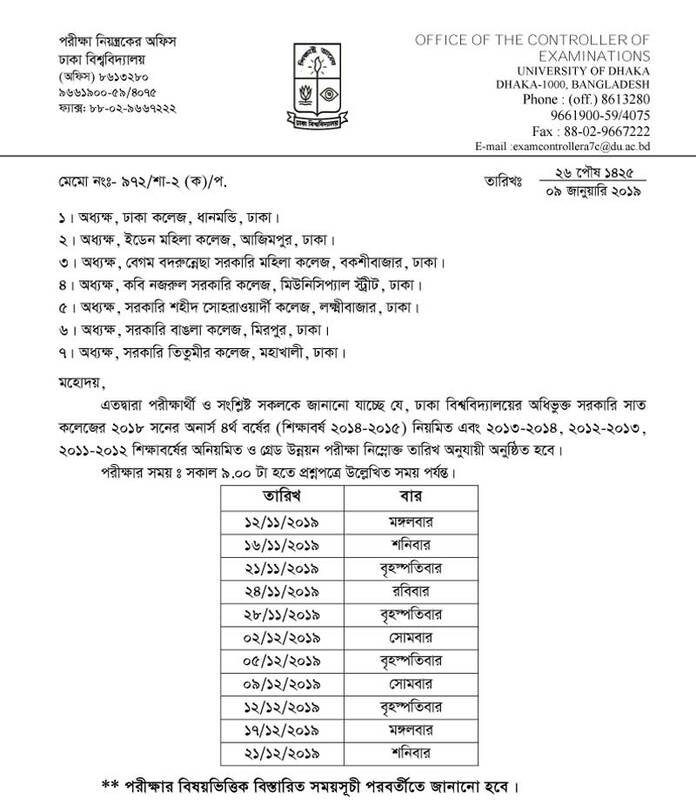 Dhaka University 7 College Honours 4th Year Routine 2019 Publish For Regular & Irregular Students. DU Regular Students Session 2014-15 and Irregular & Improvement Students 2013-14, 2012-13 and 2011-12 Routine Have been Published. Routine Have been Published. However, Dhaka University 7 College Honours 4th Year Routine Publish For 2016 Year. So, DU Affiliated 7 College Honours 4th year Exam Will Be Held 2019. DU 7 College Honours 4th Year Reversed Exam Routine Published on 27 February 2019. Now DU Authority Change The Exam Routine. So, Check 7 College Honours 4th Year Change Routine 2019 At Dhaka University. If You Search For Included 7 College 4th Year Routine 2019, Then You Might be Come The Right Place. 7 College Under DU Are Eden Mohila College (EMC), Government Bangla College (GBC), Government Titumir College (GTC), Dhaka College (DC), Kabi Nazrul Government College (KNGC), Begum Badrunnesa Government Girls’ College (BBGGC), Government Shaheed Suhrawardy College (GSSC). All Group Students Can Seat The Exam such as Science Group, Business Group, and Humanities (Arts) Group. The Group Such as BSS, BBS, and B.Sc. According to Change Routine, Exam Will be Start From 12 November and it Will Continue Up to 21 December. So, Download DU 7 College Honours 4th Year Routine From Below. Any Type Electronics Device and Mobile Phone are Not Allow. Honors 4th Year Practical & Viva Exam Date Will be Notify Later. Note, Students, Can Not Attend The Exam From Own Institute. So, They have To Seat Exam to Another College. The Authority Can Change any Exam Date and Time With our Any Notice. Recently Dhaka District Top 7 College Added Under Dhaka University From National University. From That Time, Those 7 College Form Fill Up, Exam and Result Conduct by the University of Dhaka.